Family fun! 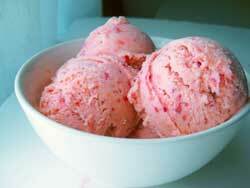 Sample ice cream and sorbet creations and tropical fruit pies from Redland farm producers. Vote for your favorite flavors during our ‘fun tasting’. Afterward, want to take your favorite flavors home? 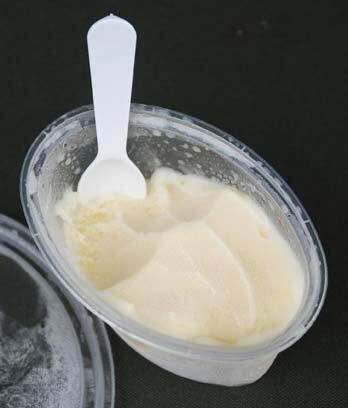 Bring cash and a cooler, with (preferably) dry ice, to keep your ice cream frozen solid. 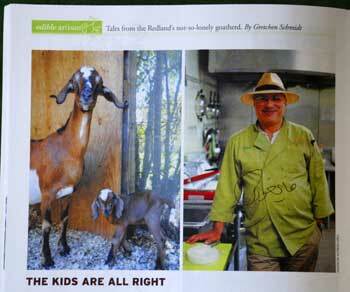 If you have been reading the local food blogs, then you knew goatherd-cheesemaker-chef Hani Khouri’s kids started arriving in March. No, not his children home for spring break. His kids, as in baby goats. These kids have been been the focus of a small media frenzy. They must be the most famous goats in the area. Hani is very excited about it. Celebrity kids, imagine that! Laurie Jennings introduces The Goat Herder. Most recently, Jonathan Vigliotti did a story on Hani’s transition from businessman to goatherd, which aired on Local 10 WPLG on May 11. If you missed it, the story and video are posted online here. In their latest issue, Edible South Florida has a great cover picture of Hani’s wife Mary Lee, holding one of the kids, accompanying a nice article. The article is by Gretchen Schmidt and photos by Alfredo Añez. Look for the magazine this month at Whole Foods and other locations. If you look carefully, Mary Lee and Hani autographed their pictures. Want my copy? Be the fifth (5th) person to comment on this post as to which is your favorite flavor of HANI’S ice cream and why, and the autographed magazine is yours! Only one comment per person allowed. Offer expires Thursday May 20 Saturday May 22 at midnight. 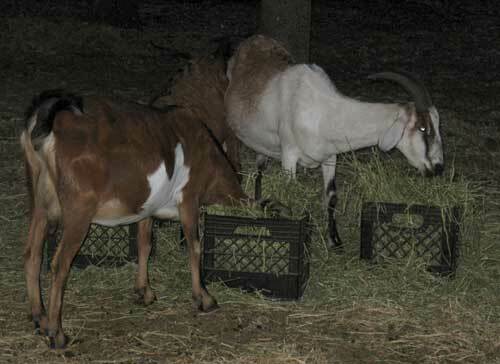 Back in March, two local food blogs have also posted about the goats. Genuine Kitchen featured the pregnant does, including the very huge Cleopatra. Shortly after, Mango & Lime came out and took pictures of Cleo’s kids, including the very pregnant doe Maria. 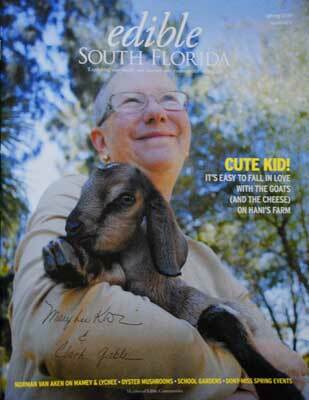 Paula’s post about the goats and Hani was featured as Blog Post of the Week on the South Florida Daily Blog. The kids are growing up. They are cute and friendly, and better yet, they are weaned. That means that Hani is back in full production with goat cheese and goat milk ice cream, and it’s as good as you remember. You can get some from Hani’s Mediterranean Organics at the Pinecrest Gardens Green Market this Sunday. Yes, it’s still going strong through the end of this month. Open Sundays, 9 a.m. to 2 p.m.
Hani signed his name in Arabic. The two best farmers markets on the weekend — and you can feel free to debate this with me — are the Pinecrest Gardens Green Market on Sundays from 9 am to 2 pm, and the Coral Gables Farmers Market on Saturdays from 8 am to 1 pm. 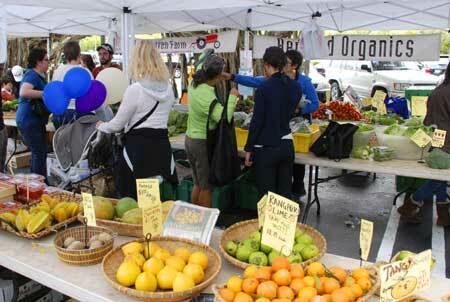 Hurry over to the Gables Market because this Saturday March 27 is the last day. Several members of Redland Organics are selling their wares there. 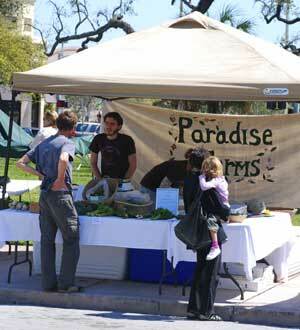 Paradise Farms, the only certified organic farmer at Gables market. 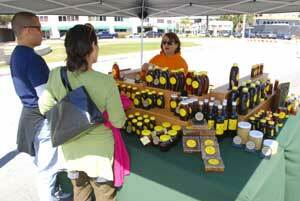 You’ll find Miguel Bode selling honey and pollen at his tent set up at the end of Biltmore Way right by LeJeune. Miguel’s wife was there last Saturday while Miguel was down in Redland checking his hives. He keeps bees at Bee Heaven Farm and at Paradise Farms. His wildflower honey is my favorite, and is a real taste of the local area. If you want Miguel’s honey but missed the Gables Market, you can also find it here, sold by Redland Organics. Everything is local, either grown on Bee Heaven Farm or sourced from organic growers within 150 miles of Miami. No telling what interesting things you’ll discover under the sprawling tent. In addition to honey, you can find certified organic fruits, vegetables and herbs, along with bunches of flowers and dried fruits, and Paradise Farms oyster mushrooms (subject to availability). Word up to CSA members — the produce in your Saturday box is also available at market, so if you want more of something but didn’t find it in the extras box, go to Pinecrest. You can also find things at market which never make it into your CSA box, particularly fruit and herbs. On one recent Sunday, I saw rangpur limes, which look like small oranges but are not quite as tart as the familiar green limes. 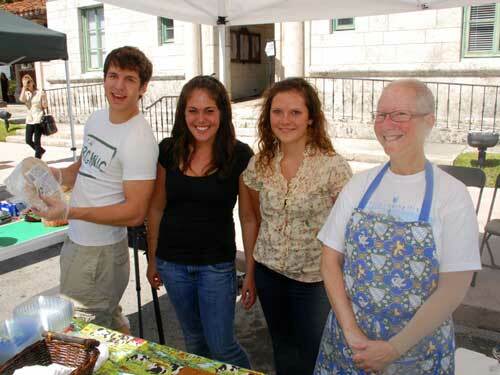 The Pinecrest Market will run through April. An assortment of familiar and unusual fruit at Redland Organics. Hani Khouri of Redland Mediterranean Organics and Sous Chef 2 Go announce the start of their cooking classes at Sous Chef 2 Go location in the Greenery Mall in Kendall. The first series of three classes begins on Wednesday, February 17, 2010 from 7:00 to 9:00 pm. The objective of the classes is to: increase cooking skills, develop a healthier lifestyle, and learn to budget food better. You will also enjoy the fruits of your labor! The fees for the series include all class ingredients and food. Wine and other beverages will be provided and are included in the cost. Series fee: $400. Book early, as each series is limited to 10 people. Make your reservations online at Sous Chef 2 Go then click on 1st 2010 Cooking Classes, or register in person at the store. Hours are Monday – Saturday 9 am – 8 pm. Hani Khouri of Redland Mediterranean Organics is waiting for his kids to arrive. 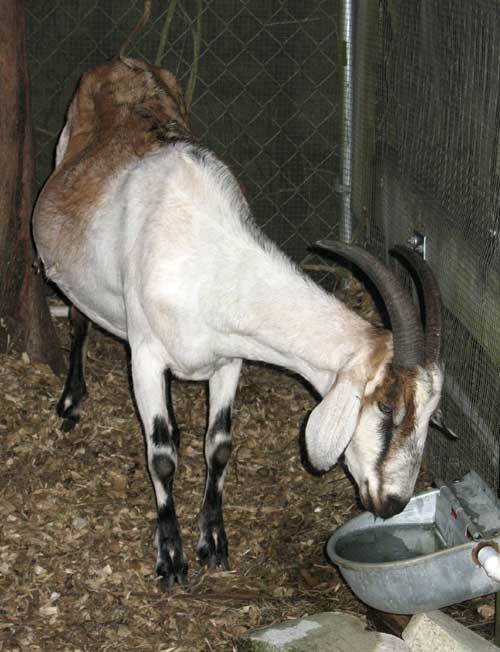 Actually, his does (female goats) are pregnant and due to deliver their kids (baby goats) in mid-February or early March. Giving birth to a baby goat is called kidding, I was told. Really, I’m not kidding. 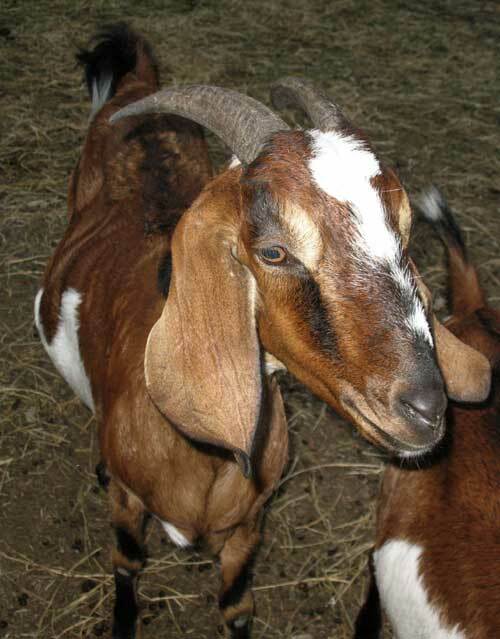 Hani keeps a small herd of Nubian goats, six pregnant does and one buck, and they’re all about one to two years old. This is the first kidding for the goats. This is also Hani’s first kidding and he’s excited, nervous and watchful of his herd. One doe named Cleopatra (whose picture you might have seen in the CSA newsletter last Saturday) is huge and very round. She started standing off to one side and went off her feed, which goats do when they’re sick, and that gave Hani the worries. But the vet checked out Cleo and said she’s ok, that’s also what pregnant goats do. So it’s watch and wait for now. All this family excitement means no cheese and no ice cream in the CSA shares and at market. Too bad for us humans! The does need to save their milk for their kids. Hani can start milking three to four days after the births, after the kids get the colostrum. But even then he can’t milk as frequently or as much, until the kids are weaned at about two months age. Only then will Hani be back into full production. Can all you hungry cheese fans wait until April or May? Looks like you’ll have to. Hani checked with other goat cheese producers in the state, and all their does are pregnant too. No fresh, local goat cheese to be had anywhere. Eating with the seasons — including goat seasons — is part of eating local food supplied by local growers, so you’ll have to be patient! 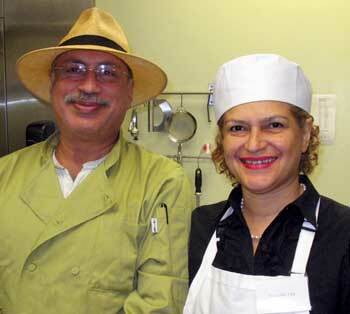 Chef and goat cheese maker Hani Khouri of Redland Mediterranean Organics has joined forces with Martha Montes de Oca, owner of Sous Chef 2 Go, to offer ready-made takeout lunches during the week. 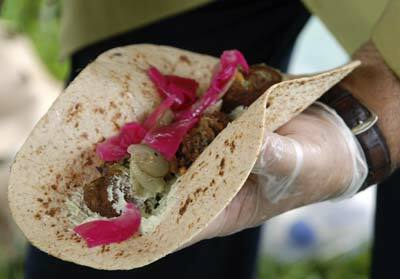 You get a choice of one of Hani’s Lebanese dishes or one of Martha’s Hispanic creations. Prices range around $7-9 for the meal. Right now the prepared lunch is strictly takeout. Bistro tables will be set outside when the weather is cooler. Also, fresh local produce will be for sale at the store in a few weeks as the season picks up. I dropped by a few days ago to check things out. Hani’s special of the day was lamb kofta. He was busy in the kitchen patting ground lamb between his hands and shaping it into oval kebabs, then cooking them on the grill. 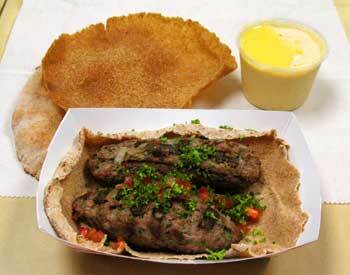 Lunch was two generous sized kebabs topped with chopped parsley and ripe tomato, resting on a pita. The lamb was cooked through, seasoned with minced onion, a dash of chipotle and other spices. A generous dollop of hummus topped with a puddle of olive oil was served on the side. Humble hummus, I’ve had it a million times, but Hani’s actually tastes like chickpeas! Martha’s lunches are Hispanic in flavor. Her daily special was chicken fricassee simmering in a crock pot. Its delicious aroma filled the kitchen and made my mouth water. She explained that all her ingredients are organic except for the meats. The customer has the option of organic (more expensive) or natural (less expensive). She also said, with a proud smile, that she deciphered the familiar favorite Sazón Goya, and created a similar blend with all-organic seasonings minus MSG. To find out what the lunch of the day is, go to the Sous Chef 2 Go web site and click on the picture of the take-out bag. That will lead you to the lunch/takeout menu. Drop in for lunch, or call ahead to order a recipe that you can cook at home.